Knights, princesses and dragons - it doesn't matter how old you are, castle playing is always fun. Our wooden castle has seen several jousts, medieval quests and rescues. Many a dragon has been spotted flying overhead or sneakily lurking around the turrets. The king and queen have told their stories and been entertained in turn. The valiant knights have shown remarkable chivalry. Horses have galloped through the drawbridge, just before it has been pulled up. Occasionally a lego figure or a zoo animal finds its way along the musty corridors, and the knights merely nod in passing. that it is time for Small Knight to have his first suit of armour and his first horse and his first shield and his first sword and to go out to fight his first fierce dragon. But Small Knight doesn't even know what a dragon looks like, let alone how to fight one. 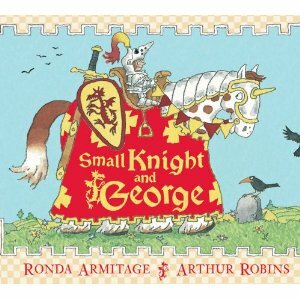 Small Knight didn't feel big and brave; he felt little and frightened. On his journey he meets several people who answer his request for a fierce dragon sighting with the same phrase - "Don't talk to me about fierce dragons ... are you sure you want to fight a very fierce dragon?" Of course, our small hero's confidence wanes with every negative conversation. Finally he meets a small displaced creature whose home has been taken over by fierce dragons. Together they turn back home to the castle, to be met by frightened shrieks. Can you guess why? Lots to love about this book - fabulous repetitive phrases, encouraging story of feeling brave and facing your fear and detailed pictures of castle life by Arthur Robins. It doesn't matter how many stories of brave knights or fierce dragons you have heard - kids are very good at imagining their own tales of quests and adventures! "Come over to play at the Childhood 101 We Play link up." Love that castle! They do have a wonderful imagination, don't they. Thanks for linking to We Play this week. Hi Christie, the castle is made by Wanju. It comes with separate pieces which you construct yourself in the same way each time. The instructions are good, but I still have to focus hard to put it together! Our Tom (7yo) who is a fabulous 'builder' can't put it together by himself yet. However, this means he still has lots of growing and playing with this castle. It is for ages 3+, and comes with wooden knights, a king, a queen and a horse. We bought the last one from a toy shop in Melbourne two years ago when it was on sale, as a joint Christmas present for Tom with my family. It works well for us because it is neither pink and princessy nor weapon-orientated and gruesome.